Culpeper and the surrounding area does have amazing roads on which to ride, however you may not know that Culpeper is also home to some amazing mountain biking. In Culpeper, we are lucky enough to have the Culpeper Area Mountain Bike Organization (CAMBO). CAMBO is an organization that puts mountain bikers and land owners together and CAMBO leases property in which to build trails and host rides and events. 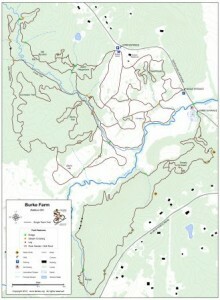 Currently, CAMBO’s main trails in use are located in Rixeyville, VA at Burke Farm with over 300 acres and about 15 miles of switchbacks, single track, rock gardens and field trails. For beginners, there are bypasses around the more technical sections and also easy, rolling field trials for beginners. For advanced riders Burke Farm offer technical rock gardens, steep climbs, log jumps, bridge crossing and tight twisty single track. For those not wanting to ride alone, CAMBO also offers a bunch of weekly rides for riders of all abilities. You can read all about CAMBO’s weekly rides on the CAMBO website. A helmet is required at all times while riding at any CAMBO event. For more information about CAMBO or how to join, be sure to check out their website.